Every nutritionally crazy person will need to add a smoothie to his diet and to make one you will need a quality blender. Though Vitamix offers a good rage of high-powered emulsifying blenders, the best and most popular ones are Vitamix 5300 and 7500. But, how to choose between the two? It can be quite a challenging task for a buyer to select the one. Both these models are the tried and tested ones for the given price range. When you compare them, you will notice that both these models are quite familiar in many aspects, but with a close look you will understand that Vitamix 7500 is the upgraded next generation model of Vitamix 5300. The next question is, Is the upgrade worth the extra bucks that you will be asked to pay for the 7500 models? Both models of Vitamix 5300 and 7500 have a 2.2 HP motor. It can do the chopping, grinding, pureeing and blending or crush any vegetable (almost any) you put in them with equal effectiveness. But there are some differences. Vitamix 5300 comes with older version of motor whereas 7500 has a new generation motor and an impressive looking housing. The 5300 models have standard air vents to keep the motor cool, whereas 7500 is fitted with extra large air vents to make sure that the motor never gets hot. Vitamix 7500 is also equipped with a cooling fan and a better overheating tripping relay. Both the models have 64 oz jar that is enough to make juice for a small group. We suggest that while blending go for a quantity less than 64 oz. Usually, the jar is made of glass so that you can see and control the process. But there are stainless steel jars also available in the market. They are more durable than the glass ones, but you can always make sure to handle them carefully. The glass jars come with calibration marks so that you can produce a specific quantity of juice if need be. This feature is quite useful if you want to make a smoothie mixing fixed amounts of different liquids. The design and material of cutting blades is a significant performance criterion for any blender as it will decide the cutting effectiveness, noise levels, and the vibration when the blender is operating at optimum speeds. The cutting blades in both machines are made of aircraft quality stainless steel, designed for long-lasting operation. Both models have 4-inch stainless steel hammermill blades, positioned and balanced for maximum chopping power. These are not razor sharp, rather designed with extra strong blunt tips to preserve their effectiveness and to be able to last long. But, Vitamix 7500 is better as it has modern motor design and casing with extra larger vents to avoid overheating. It also produces lesser sound at top operating speeds. Both models have similar 2.2 HP motors, but 7500 has a better casing. Vitamix 7500 has improved motor housing, whereby it produces lesser 88 DB sound. It gives 40% quitter blending on top speed. In comparison, the 5300 model produces 98 DB sound at high speed. The good thing is that both the models are quite stable even at the maximum operating speeds, thanks of the design with a heavy base. These models do not have the single button programmable function, by which you can press it and forget it. But, 7500 has a better-looking control panel, and if you love aesthetics, then this is the model for you. The speed knob is designed for 10 no operating speeds to fine tune the quality and fineness of chop for your smoothie. 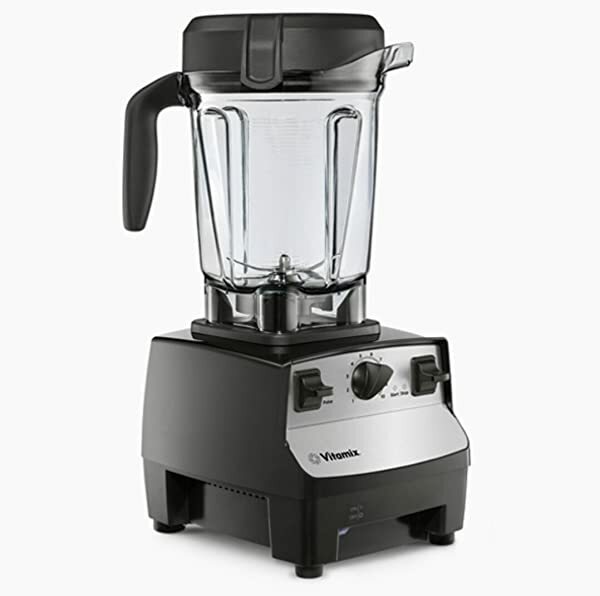 The Vitamix 5300 Vs 7500 comparisons cannot be complete without reviewing the safety aspects. After all, blenders use lots of power and generate heat during the process, especially if you want to use them for more extended periods. Vitamix 7500 has better-designed housing with extra large air vents. It helps to keep the motor cool even after long operational periods. The 7500 model is also equipped with a cooling fan and a thermal tripping relay to switch off the unit if it gets overheated. It makes the machine safer compared to Vitamix 5300 that needs close supervision. The Vitamix machines are easy to maintain and are self-cleaning types. Add some water in the jar, add some washing soap and operate the machine for 2-3 minutes to get the perfect clean. This method is effective, but we recommend after few uses clean the jar once manually using a sponge. The juicer comes with detachable design to help easy cleaning. The jar is not dishwasher friendly so avoid cleaning through a machine wash. The Vitamix machines are of exceptional quality and come with 7-year manufacturer warranty. The warranty for durable and excellent performance applies to both the new and refurbished units.The Vitamix 7500 unit, is a bit expensive compared to the 5300 model and costs a little more than $ 500. Model 5300 comes with a starter guide book with 70 no free recipes. The 7500 model comes with a tutorial DVD and a recipe book with 200 dishes. So, you get better information with the Vitamix 7500 model compared to 5300. In the Vitamix 5300 vs 7500 comparison, it is difficult to choose the better one for all they both offer. Both blenders offer quality, versatility, and consistency. 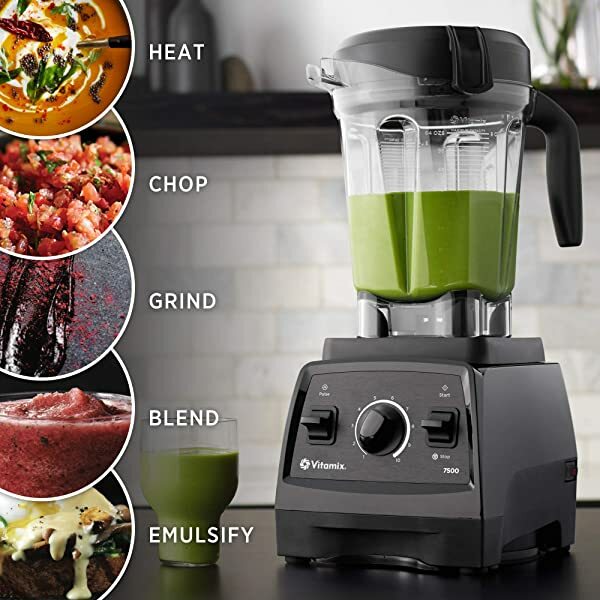 Vitamix brands, in general, are of excellent quality and offer 7 yearlong warranty, that shows the confidence of the manufacturer in its products.In terms of performance, both blenders offer similar quality of chopping, blending and juicing. We can decide the winner only on the subtler differences. The Vitamix 7500 model is a step ahead in design and sleekness. On the technology front also, it is a bit better than the 5300 model. It has a new generation motor and a well-designed aesthetically appealing housing made to keep the motor cool. 7500 model also produces less noise and vibration on top operating speeds compared to 5300. The illuminated control panel makes the Vitamix 700 visually more appealing. If budget is not a constraint, then Vitamix 7500 is our pick, and we will recommend it over 5300 model. But if you do not want to spend too much, then go for Vitamix 5300, which will also offer a satisfying service, giving the same quality of blending, though with a little more noise.